As a kid, I was insanely interested in Alaska, reading everything I could find on it. I even had the idea I wanted to be bush pilot, it was that strong an attraction. A couple of things prevented me from following through on my dream. First, I came to realize it’s probably not a good idea to let a 12 year old choose one’s career path. And second, I discovered I really, REALLY hate mosquitoes. So, um, no Alaska for moi. With Alaska sitting there as somewhat of a bucket list item for me, and needing to burn down our stash of American Airlines miles, I was able to book some first class tickets on Alaska Airlines from Orange County, thus avoiding both LAX and American Airlines. Big double win. But the tickets weren’t just to Alaska, they were all the way to friggin’ Barrow, the northernmost community in the US. And the spit of land just outside of Barrow is the northernmost point in the entire US. Seeing as how in our wayward youth Jeri and I got reasonably close to the South Pole, we thought we should do the same for the North Pole. Oh yeah, not to mention tundra, permafrost and all that goes with a frontier town on the shores of the Arctic Ocean. So yeah…..Barrow! I should add that Jeri was a bit more skeptical about the place than I, but we usually balance each other out. 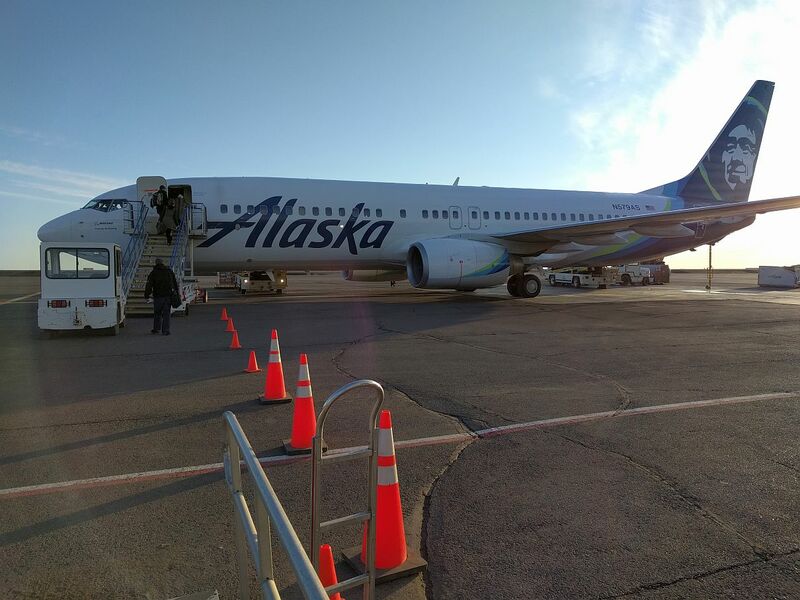 When I initially booked the trip, as part of the adventure I set it up so we’d be flying one of Alaska Airlines 737 Combis. These are a very unusual variant of your usual 737 where the front part of the aircraft (rows 1-15) is used to haul palleted cargo, then a bulkhead, then regular passenger seating from row 16 on. It’s a combination of passengers and cargo, how neat is that? 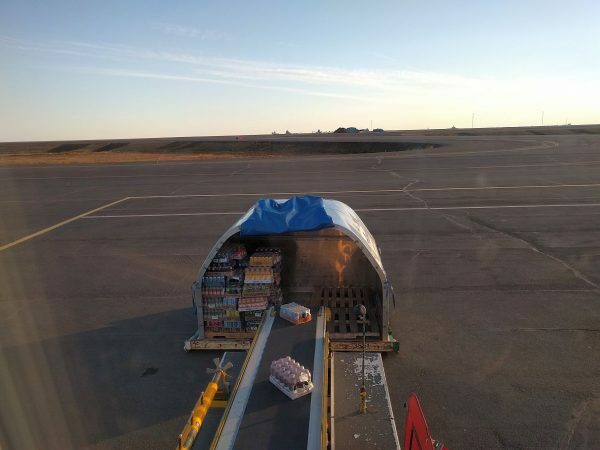 For many remote Alaska towns this may be the only way to get supplies in. Unfortunately by the time our flight came around Alaska Airlines was in the process of retiring them out and the rat bastards put us in a regular 737. Still, we were headed to Barrow. We left out of Orange County just as the morning curfew lifted and hopped to Seattle, then Anchorage where we’d be spending time on our return. After a short layover there, it was off to Barrow, just under a two hour flight. 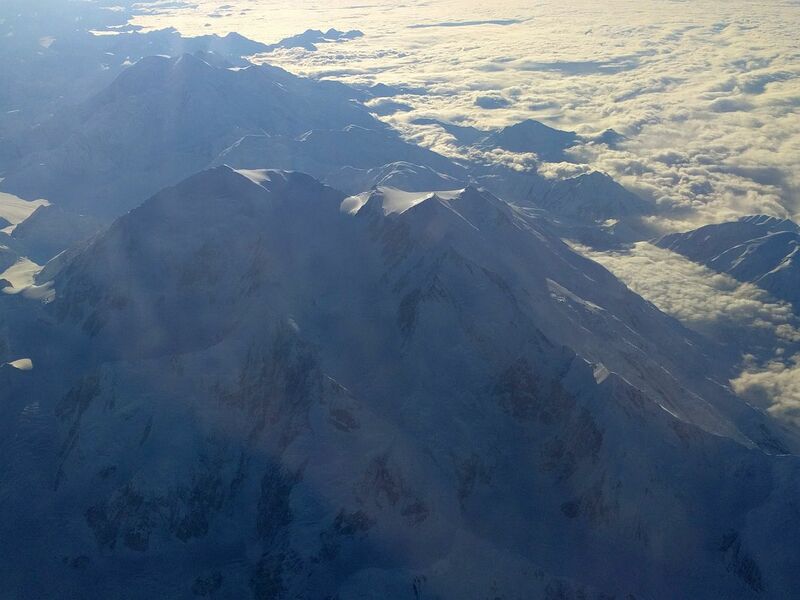 We had apparently won the weather lottery since we had gorgeous, clear views of Denali as we flew almost over it. Our weather luck continued to hold when we arrived in Barrow where it was clear and cold (mid-30s, which I suspect is shorts weather in Barrow). A fantastic view of Denali under the left side of the airplane on the way to Barrow. Climbing this must require a special kind of stupid that even I lack. There aren’t many places to stay in Barrow but I booked us in a decent place only a block from the airport so it was an easy walk on the frozen dirt roads (there’s almost no real pavement in Barrow due to the permafrost and ground heave). 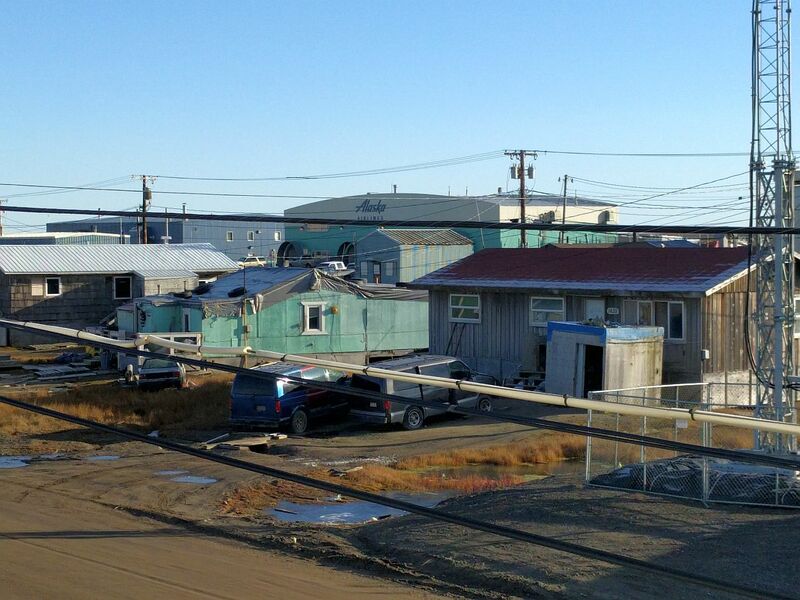 Our digs in Barrow. 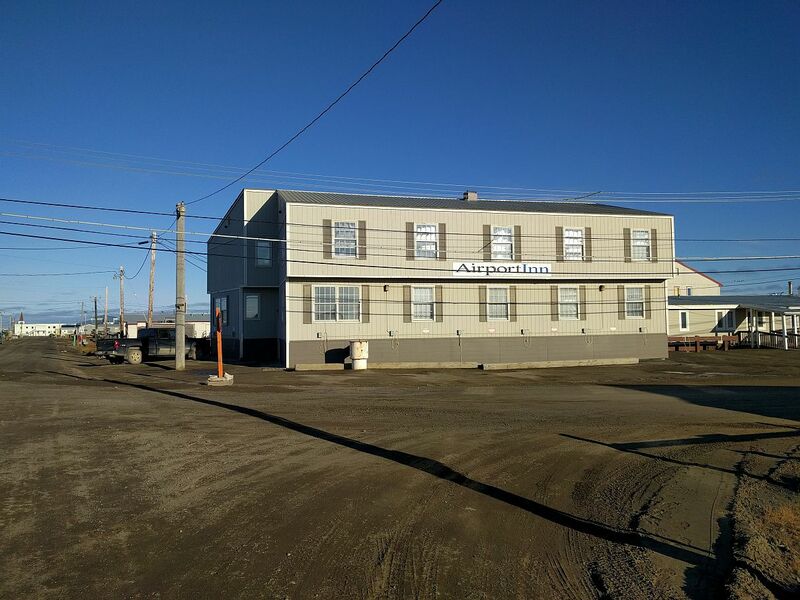 A block from the airport, clean, comfortable but expensive, as are all things in Barrow. The view out our motel window. That’s the one room Alaska Airlines terminal at the airport. First impressions were….well the town looked to be something of a dump. Maybe one step up from a shantytown, and a very small step at that. 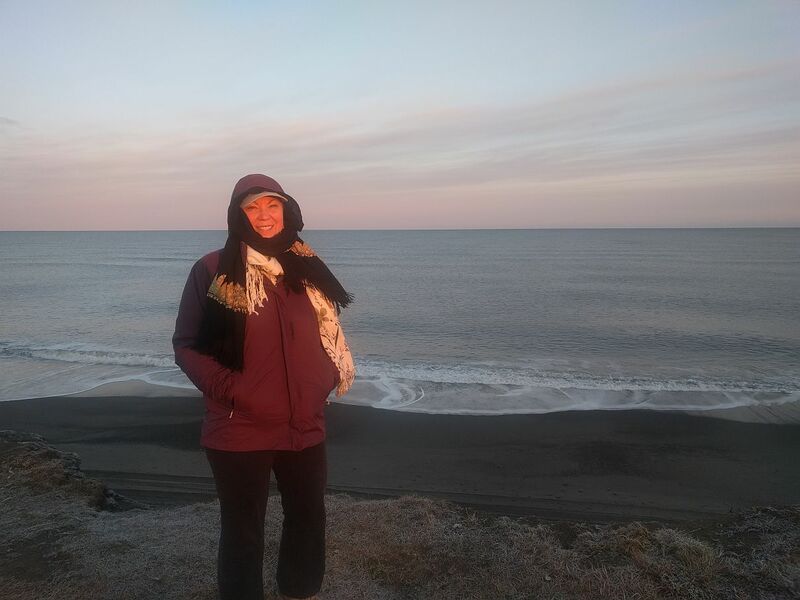 Still, it was interesting as hell and we spent the last of the light that first evening walking a few blocks north to the edge of the Arctic Ocean. Knowing we had started that day in Orange County and were now looking out across the Arctic Ocean was a very surreal feeling. 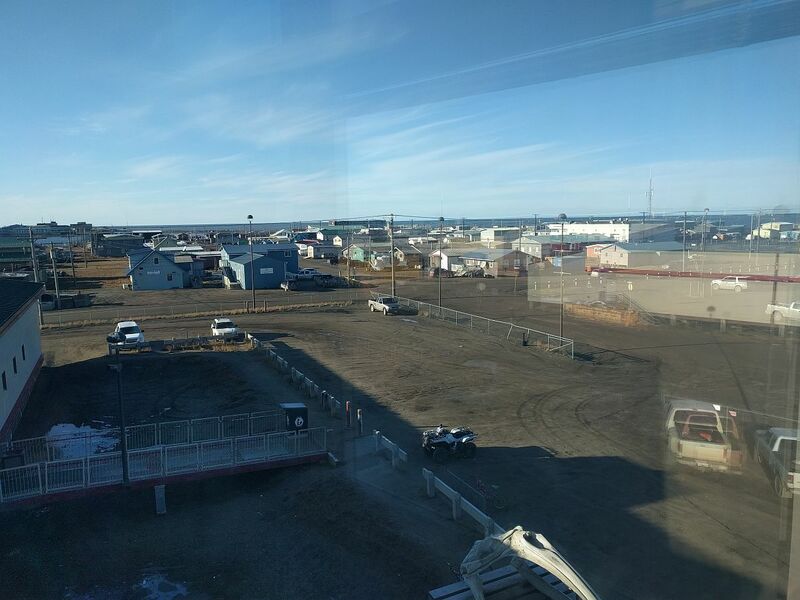 A typical view of Barrow. Pretty much what all of the town looks like. Another view of Barrow. The airport hangar is that large white building in the distant right portion of the picture. The next morning we had arranged an outstanding driving tour with one of the locals (Mike Shults who has lived in Barrow for 45 years) and found things were not as they appeared. Turns out due to oil and gas operations there is a crazy amount of money in town. However since there are only a handful of days in the year when it gets warm enough to even paint, much of the town’s houses look pretty bad from the outside. However on the inside many are quite the gems. Most satellite dishes here look a bit strange since they are almost pointing at the horizon and not up. That’s because geosynchronous satellites are above the Equator. 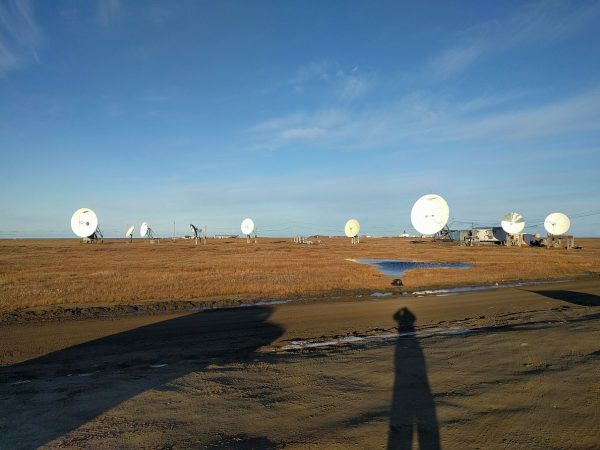 These sat links are also Barrow’s only connection to the outside world, including Internet. Polar extremes: Left is our furthest south in January, 1984 at 830 miles from the South Pole (Mt. Erebus to the left of us and the Ross Ice Shelf landing strip to the right). The right pic is our furthest north, near Point Barrow, at 1,292 miles from the North Pole. These will likely be our lifetime bests. Not too shabby. Since almost everything consumable has to be flown in to Barrow, prices seemed to hover about twice that as would be found in the lower 48. That is balanced by very high wages and somewhat of a shortage of workers who are willing to work in such a remote location. We heard repeatedly that for anyone who was willing to show up on time and be diligent, there were more work opportunities than time available. So many people in Barrow work multiple jobs, stockpiling money. Thus Barrow is a surprisingly affluent community, despite first appearances. In addition to pointing out the (limited) sights of Barrow, Mike provided an entertaining running commentary on what it’s like to live in such a weird place and its cultural dynamics. 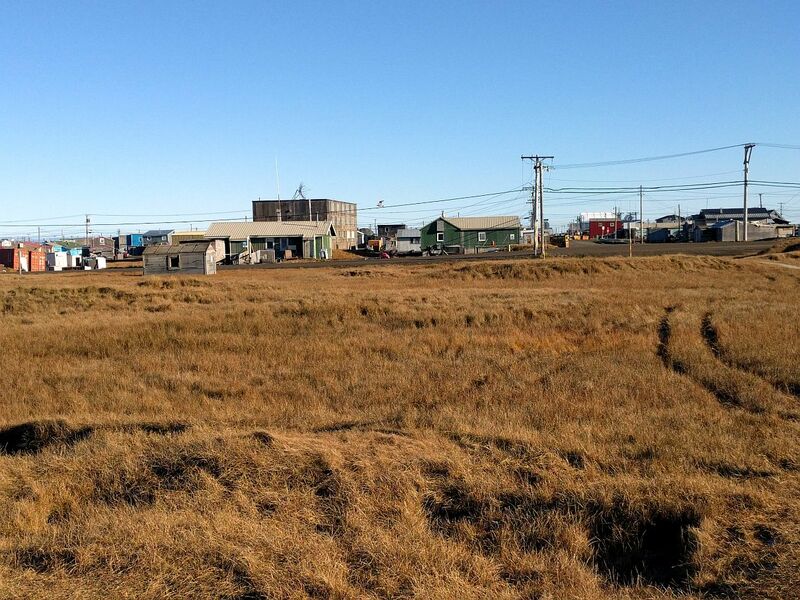 Eventually he drove us out of town almost to Point Barrow itself and we were able to get our furthest north pictures. Not as impressive as our furthest south, but it was certainly a lot easier. Departing Barrow, the airport operations were most interesting. Despite its small size, we were warned to get there early since flights often leave early. I noted that the departure schedule on the wall listed one time, our boarding passes listed an earlier one, and then there was the time we actually left, which was even earlier than the first two times. I guess they figure if everyone scheduled for the flight has boarded, why not leave? Pretty much the only way you’re getting in or out of Barrow. No jetways here. Why everything costs at least twice as much in Barrow: Unloading our 737. All in all, I found Barrow incredibly fascinating. That said, it’s probably not worth more than a day or two visit. The town is very small and it can be walked in just a few hours. 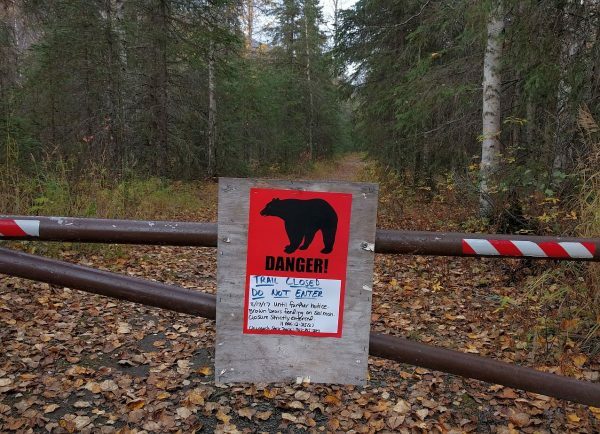 and there’s no way to get out of town as it’s surrounded by roadless tundra. Beyond photography (which is amazing) there’s not much to do. And whatever you end up doing will cost a LOT of money. But totally worth it! 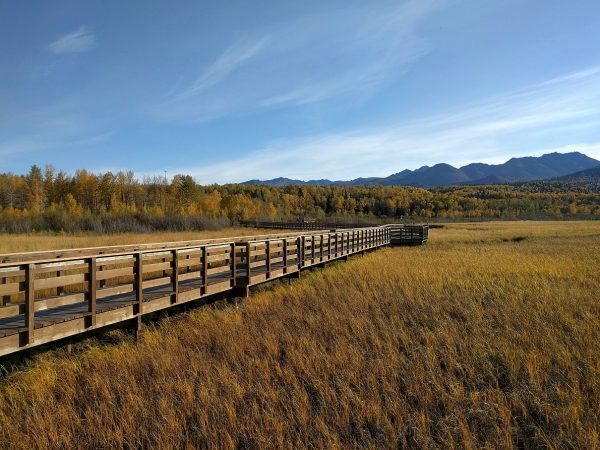 We really wanted to like Anchorage, where we spent three days, but it ended up being very “meh”. It was a pleasant enough town and all, but seemed somewhat generic and just like a number of other towns we’ve visited in the Pacific Northwest. We thought it would be more “Alaska-y” but just didn’t feel it. Perhaps if we had done Anchorage before we went to Barrow we might have felt differently. Still, once we got out of town and did a bit of exploring it was really nice. We lucked out by arriving during a time of peak Fall color change for the trees, so that was a plus. And we drove quite a ways out on the Kenai Peninsula and that felt a million miles from everywhere. 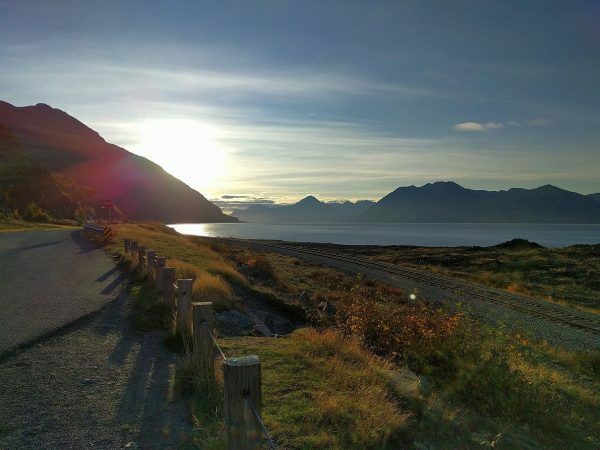 Exploring south of Anchorage along the Kenai Peninsula: Turnagain Arm. 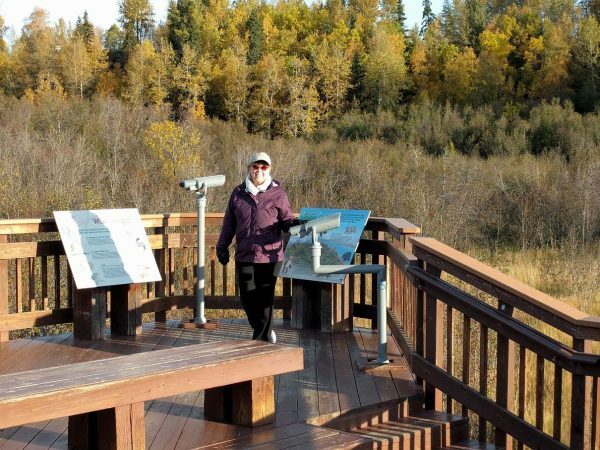 Some tourist at Potter Marsh just south of Anchorage. More of Potter Marsh and the neat boardwalk. 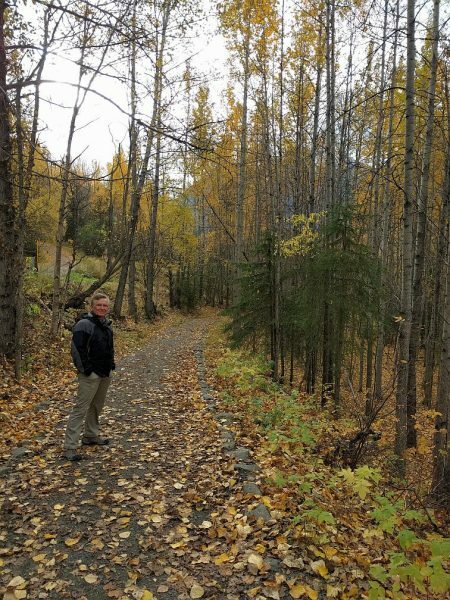 Hiking trail along the Eagle River near Anchorage. 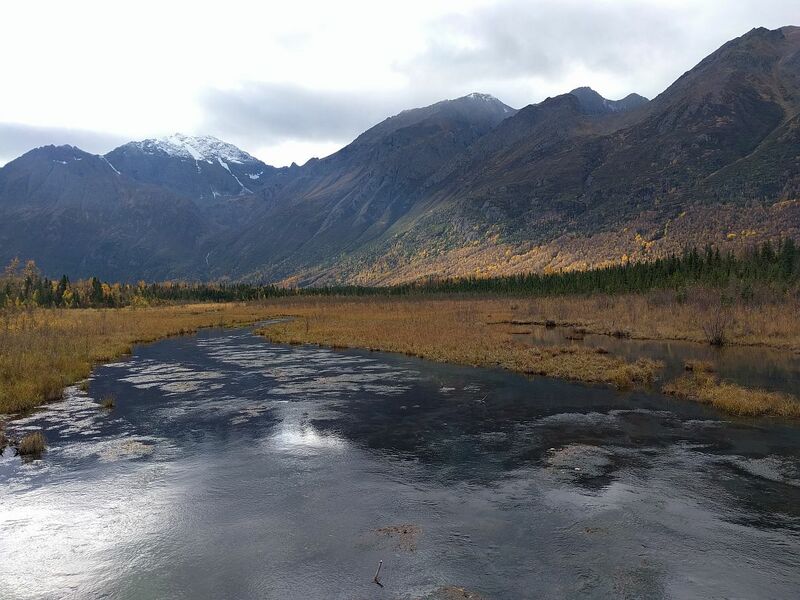 The Eagle River with a nice change of color going on in the trees. You’re not in Kansas anymore. A whole different set of concerns when in the wilderness up here. 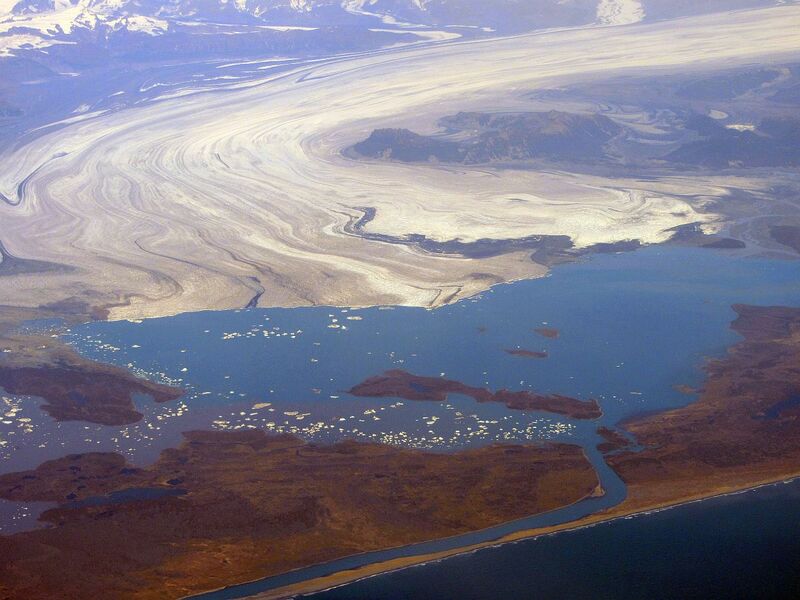 A rather massive glacier after leaving Anchorage with a lot of calving going on. In many respects Alaska Airlines is probably like AA was about 8 years ago well before its merger with US Airlines. Oh, and if you fly in Alaska’s First Class domestically, you get access to Alaska’s lounges, unlike AA. Were we going to continue our travel schedule, I’d definitely work to acquire status on Alaska Airlines rather than AA. But our travel is winding down with only a couple of long haul trips remaining on our schedule, then……other adventures.